Nothing quite like some mac & cheese! Last night, I was craving some of the cheesy goodness, so I decided to boil up some water and give this mac & cheese a try. Anyway, the taste was acutally pretty good. Not too salty, and a mild cheddar flavor. The noodles turned out to be tender and slightly chewy. I ate this with some green beans and some Smart Bacon. Overall, 3 stars. I love that the ingredients are good, but wish the cheese flavor was more prominent and a thicker sauce. Perhaps I will use less milk next time. 2.5 ounces ( mix not prepared) is 270 calories, 4 grams of fat, 2.5 grams of saturated dat, 46 grams of carbohydrates,2 grams of fiber, 5 grams of sugar and 10 grams of protein. 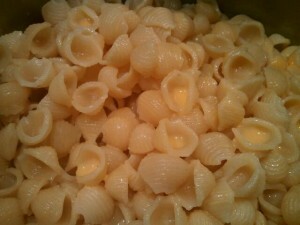 What is your FAVORITE boxed mac & cheese? everytime I look at this picture, i think the peanuts in the top corners are my fingers holding the box up. hah. 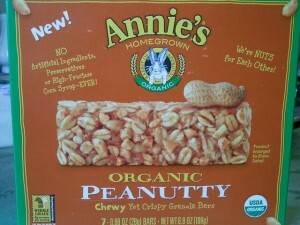 Browsing Target, I spotted something new by Annie’s- Organic Peanutty Chewy Yet Crispy Granola Bars! Since I love new products (aaaaand I’m a total impulse buyer) I bought them and took them home. On the box, it states that these have “NO Artificial Ingredients, Preservatives or High-Fructose Corn Syrup- EVER!”, so I could tell I was already starting to like these! I opened up the box, and was a bit disappointed at the size. They were about the size of a LARAbar, but not as wide. 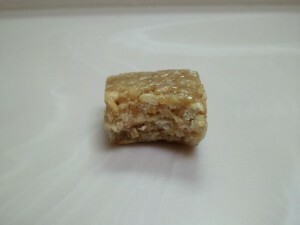 Usually I prefer a more heftier sized bar for a snack, but then again, taste is what it’s all about! I took a bite, and found it to be rather dense. It indeed did live up to the name, it really was “chewy yet crispy” in consistency! I also thought it had quite a bit of a sticky feel. It had a good peanut flavor, but really wasn’t all too sweet. I also detected just a hint of vanilla flavor. 1 bar (28 grams) is 120 calories, 5 grams of fat, 17 grams of carbohydrates, 1 gram of fiber, 5 grams of sugar and 3 grams of protein. Mac & Cheese! Normally I’m not a pasta person. Spaghetti? Ravioli? Nah, I’ll have rice or bread instead. But, Mac & Cheese has always really been my one exception. Something about the cheesy sauce and the tender noodles that I love! 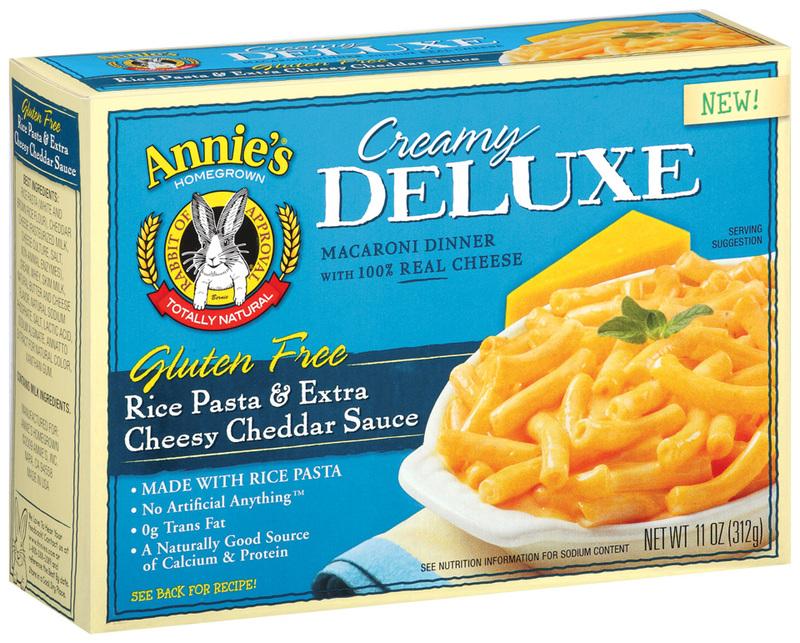 Well, to add to my Mac & Cheese enjoyment, I had the opportunity to try Annie’s Homegrown Gluten Free Rice Pasta & Extra Cheesy Cheddar Sauce. Annie’s Homegrown generously sent me 2 boxes of this stuff, and I couldn’t have been happier. 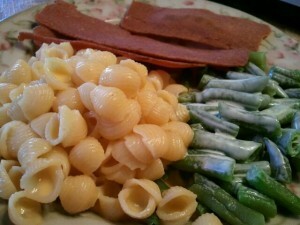 I especially like mac & cheese when it has the creamy cheese sauce rather than the cheese powder when I have to add milk & butter as well, I find the cheese sauce varieties to always be more tasty! Some things to point out is that this pasta is gluten free, and is rice pasta. I never had a gluten free mac & cheese before, so this was certainly new for me. According to the front of the box, this product has “No Artificial Anything, 0g Trans Fat, A Naturally Good Source of Calcium & Protein”. Sounds good to me! I looked at the nutrition information, and saw that this product was relatively low in fat, only 4 grams per serving prepared. I also noticed the sodium was a bit high, 680 mg per serving prepared, and this product also had 63 carbohydrates per 1 cup prepared! I know pasta has carbohydrates, but I felt this was higher than what I was used to. I stirred the cheese sauce in, and noticed how nicely it adhered to the noodles- a good sign. I don’t like when the noodles and cheese sauce to mix well, but that wasn’t the case here! The noodles & cheese sauce thickened up quite nicely as well. I put some on my plate and gave it a taste- not bad! It has a mild cheddar cheese taste, not too salty, either. The noodles were perfect, just the right amount of tenderness, and not chewy at all. 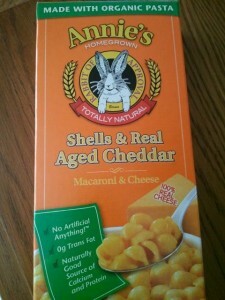 My brother tried some, and he said it was “cheesy”, and seemed to enjoy it as well. Overall, I give this pasta 4 stars. I do wish it tasted a bit more saltier, as I feel as if that would have brought out a stronger cheese flavor. I do like, however, how the pasta and cheese sauce thickened up so nicely, and how it was low in fat. I think this is a GREAT option for those who cannot have gluten, or for anyone, really! I couldn’t tell the difference between having rice pasta as compared to what I normally have, which is wheat/ whole wheat. 1 serving, about 1 cup prepared, is 320 calories, 4 grams of fat, 63 carbohydrates, 2 grams of fiber, 2 grams of sugar and 8 grams of protein. Rice Pasta (white and brown rice flour), Cheddar Cheese (pasteurized milk, cheese culture, salt, non-animal enzymes), Cream, Whey, Skim Milk, Natural Butter and Cheese Flavor, Natural Sodium Phosphate, Salt, Lactic Acid, Sodium Alginate, Annatto Extract for Natural Color, Xanthan Gum. 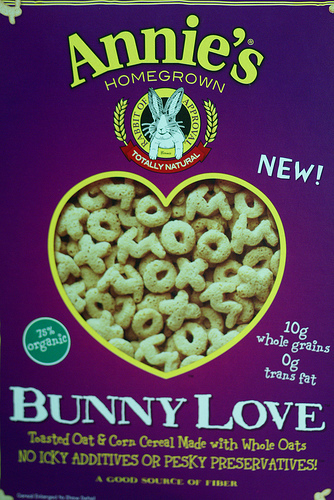 In honor of Annie’s Homegrown‘s birthday, I think it would be appropriate to do a review on a cereal I bought, Bunny Love. This cereal is an all natural, whole grain, corn & oat cereal, made without preservatives or fillers, and is vegan. I decided to pick it up at the store because it was pretty enticing and the nutritional stats fit for what I generally look for in cereal. It was a royal purple box, with pictures of bunny-shaped cereal on the cover. Cute! It was only 110 calories per serving with 3 grams of fiber, and 2 grams of sugar, so I figured it was worth a shot. I tried this cereal a couple of ways (including yesterday’s recipe!). I poured a bowl of it and examined the shapes- adorable! So cute! 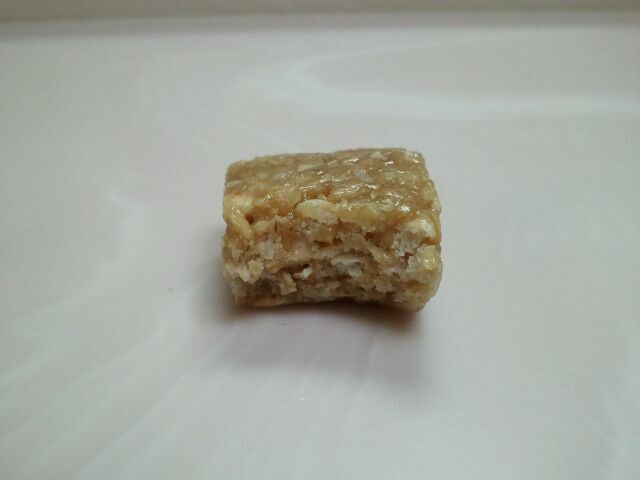 Each piece certainly is crunchy and has a mild, toasted oat flavor. In fact, this cereal really isn’t sweet at all. I probably wouldn’t eat this on it’s own (as I had hoped for from the cute shapes! ), but I found it was good paired with some flavored yogurt. Stonyfield Farm Banilla yogurt and Chobani strawberry greek yogurt were two excellent ways to pair with the cereal. It provided sweetness and a nice crunch to the yogurt. I also liked this cereal paired with some chocolate and vanilla soy milk. I’m sure you can use almond milk as well, but the flavors in the soymilk went nicely with the oaty taste of the bunnies. Overall, given that it was not intended to be a sugary cereal, I give this cereal 3 1/2 stars, by itself, 4 paired with yogurt or flavored soymilk. The nutrionals are excellent-whole grains, fiber and all natural- but I prefer my cereal just a wee bit sweeter so I can munch it out of the box. 1 serving is 110 calories, 1.5 grams of fat, 22 carbohydrates, 3 grams of fiber and 3 grams of protein. So we all love Teddy Grahams-no? But do we also love the hydrogenated oils and high fructose corn syrup? Eh, I think not. Just looking at the ingredients for Teddy Grahams makes me sick. So, imagine my excitement when I came across Annie’s Bunny Grahams. These cute little guys come in 4 flavors, Chocolate Chip, Cinnamon, Honey and Chocolate. They also have cheesy flavors, but I’ll talk about that at a later date. Good thing is, no trans fats, all natural, and they provide 20% daily calicum need (more like 60% for me including i had more than one serving!). 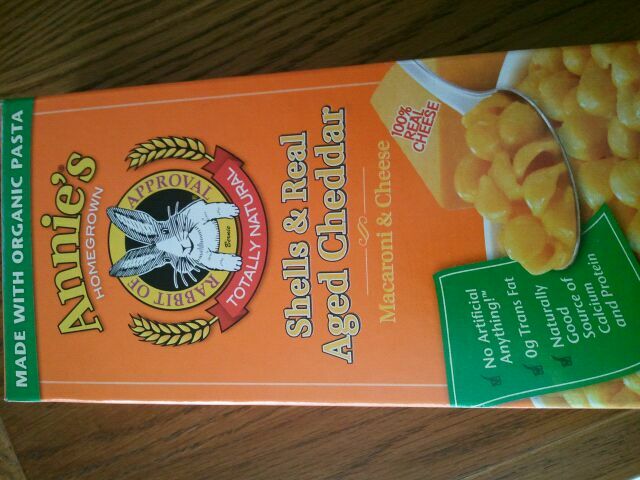 28 grams, about 30 bunnies or so, is 140 calories, 4.5 grams of fat, 22 carbs, >1 gram of fiber and 2 grams of protein. Organic Wheat Flour, Organic Evaporated Cane Juice, Expeller-pressed Vegetable Oil, Organic Corn Flour, Organic Graham Flour, Cookie Bits (wheat flour, organic evaporated cane juice, sunflower oil, alkalized cocoa, salt, baking soda), Calcium Carbonate, Chocolate Chips (sugar, unsweetened chocolate, cocoa butter, soy lecithin, vanilla extract), Natural Flavor, Baking Soda, Salt, Organic Chocolate Flavor.